Are you looking for an enjoyable (and cute) Halloween game to play? 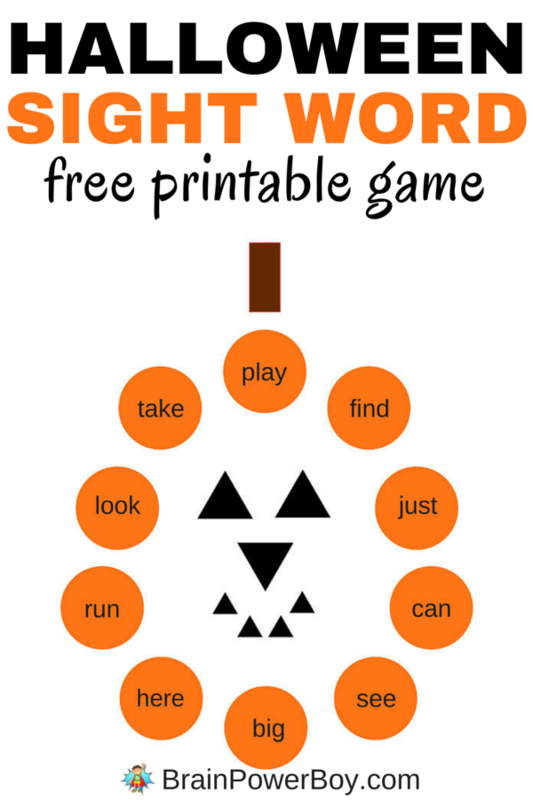 Try this free printable sight word game. We had a lot of fun making this for you and hope you and your kids will like playing it. Sight word games are a wonderful way to play around with words. This Halloween Sight Word Game Printable is perfect for this time of the year, don’t you think? Pumpkin boards and cards are included so you only need to grab some markers to play. This game is free! We love to bring you resources to use and free printables are one of our favorite things to share. I have included two game boards in the pdf file. One pumpkin board has some preschool dolch sight words and the other one is blank so you can add your own words. Carefully cut the card deck into squares. I use this slick paper cutter because it makes nice straight lines which I don’t get with scissors. This game is very easy to play. It is set up as a fun way to play with words so there is no winner. If you want to play competitively, you can keep track of how many words each person gets right. The winner is the one with the most correct words at the end. Put your markers on the pumpkin stem. You can use pumpkin seeds or even LEGO minifigs as your markers. Draw a card and follow the directions. Go clockwise around the pumpkin board. Go around however many times you decide on or just go around once depending on the interest of the child. This is a cute game! I used to work in afterschool and the more we could turn learning into fun games like this – especially if an adult or older student were playing with them – the better it went. They love learning this way. Thanks for the creative idea! Awesome game idea! I am sure we would have to get the lego guys out to play. Thank you for sharing this great game. I’m always looking for new fun things to do with son. We can never have to many games ? I appreciate you stopping by. I hope he likes the game. I teach kindergarten and my class will love this game. They are all about Halloween right now. Thanks Kim! I know they do get excited about Halloween. How fun! I think I will try this with my class on Monday! That is great to hear Destiny! I hope your class enjoys it. This a cute and smart idea! Thank you LizZ. I appreciate the comment. I really like game play for the reason you explained. It is fun, the kids like it and the learning is natural. Thanks for taking the time to comment. we are always looking for fun ways to learn sight words. Perfect for this time of the year with the pumpkin design! Pinned! Thanks for pinning Susen. I’m glad we could add a holiday game to your sight word learning. Hello there! It’s your neighbor on the Thoughtful spot blog hop. I love how this incorporate site words with a Halloween theme. My son fights me so much in reading…and I adore anything that makes it interesting for him. Thank you for stopping by Lyn, I am sorry to hear about your situation. Fighting and reading don’t go well together that is for sure. I’m glad you are trying to make it interesting for him.